I learned a new vocabulary word on today's ride: soroptimist. The word was posted on a few signs along Highway 9, including an "Adopt-A-Highway" sign. As a fan of optimism, I filed the word away in my brain, excited to look up the definition in a dictionary. When I later had access to a dictionary, I was somewhat disappointed to find that the word referred to a global women's organization, whose members help to improve the lives of adult women and girls. Not that there's anything wrong with this organization or anything, but soroptimist ain't exactly a word I can easily throw into everyday conversation. Oh well, at least I was able to use the word in this blog post. 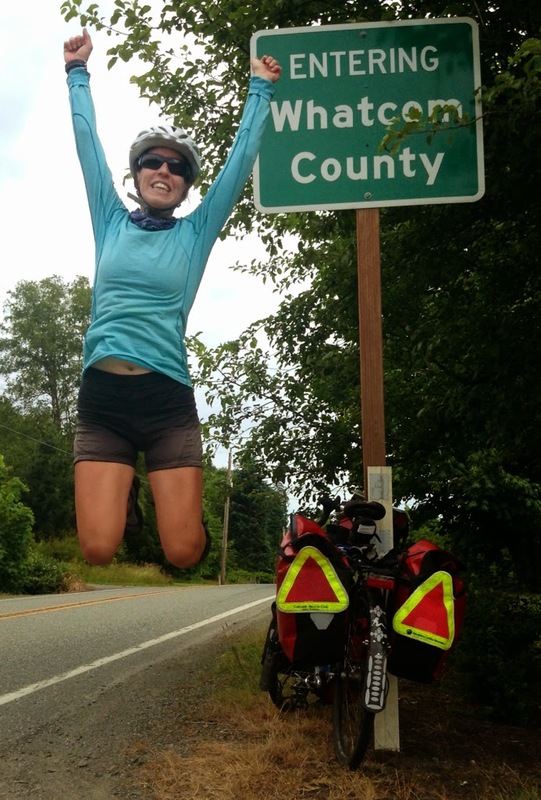 When biking across county lines, I vocalize a "woohoo" in recognition of a sort of "rite of passage." On last year's cross-country trip, particularly in the eastern part of the country, it wasn't uncommon to ride through multiple counties in a single day. Woohoo! Woohoo! Woohoo! County lines on this trip have been much harder to come by. At the beginning of our trip, for example, it took a few days before we passed from San Diego County into Riverside County. As the rarity of county border crossings on this trip has increased the preciousness of the border crossing experience, crossing the final county border into Whatcom County warranted that my "woohoo" be accompanied by a jump for joy. Jumping for joy as we enter our last county. The official Sierra-Cascades route stretches from the Mexican border (at Tecate, CA) to the Canadian border (at Sumas, WA). When it comes to routes, I'm not a route purist. In other words, I don't feel as though I need to bike the entire route in order to say that I've biked the Sierra-Cascades route. Before Alex joined the trip, I had planned on beginning the ride in San Diego and heading directly east to join up with the official Sierra-Cascades route; I was fine bypassing the Mexican border. Once I had reached northern Washington, I had planned on heading directly west once I had reached Seattle's latitude; I was fine bypassing the Canadian border. When Alex decided to join the trip, it was important to him that he ride from border-to-border. Glad to have a riding buddy along for the ride, I agreed to ride southeast from San Diego so that we could have a ceremonial photo op at the Mexican border. I also agreed to ride the extra 150 miles north of Seattle so that we could again have a photo op at the Canadian border. Tecate ended up being an anti-climatic "official" start to the ride, and so I'm glad we had actually started our trip in San Diego. As Sumas appeared to be a similarly small town, I figured that the Sumas border would likewise be anti-climatic. 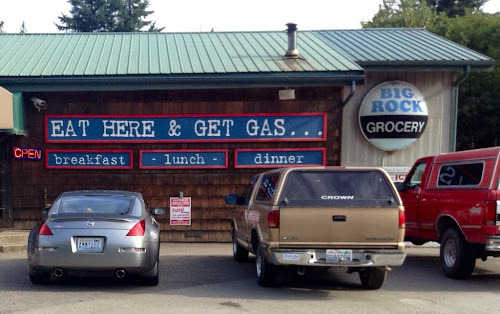 Yesterday, I told Alex that if Sumas was a ho-hum town, then I would prefer to continue riding south towards Bellingham after reaching the border. After all, I'd prefer to end the trip biking rather than spending a few hours in front of a wifi connection waiting for a ride home. Alex replied that he wanted to finish the ride to Sumas before deciding whether to ride further. That sounded reasonable. 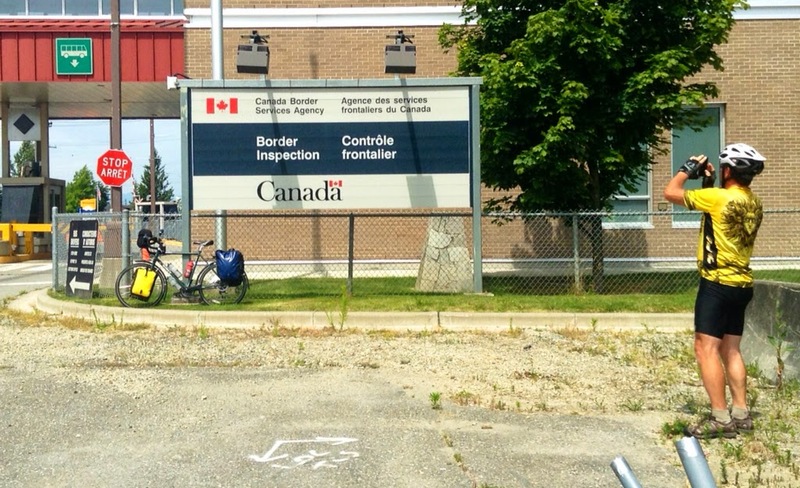 We got to Sumas, where Alex took a ceremonial photo of the Canadian border sign. This was a well-deserved photo opportunity. Kudos to Alex for riding the Sierra-Cascades, biking the entire route from border-to-border. He did a great job on this ride! The Sierra-Cascades ride is a difficult one -- particularly for a cyclist's first tour. Heck, I know cyclists with plenty of touring experience who are intimidated by the Sierra-Cascades route. Yet, Alex conquered this beast of a ride. He makes me proud. I'm glad he was able to join along for the ride and fulfill his dream to do a cross-country bike trip. Taking a photo of Alex taking a photo of his bike at the Canadian border sign. Having arrived in Sumas, we had accomplished our goal. Sierra Cascades ride…done! As suspected, however, Sumas was a ho-hum town, and the arrival into town was just as anti-climatic as the arrival into Tecate. This wasn't exactly the way I wanted to remember the end of the trip. 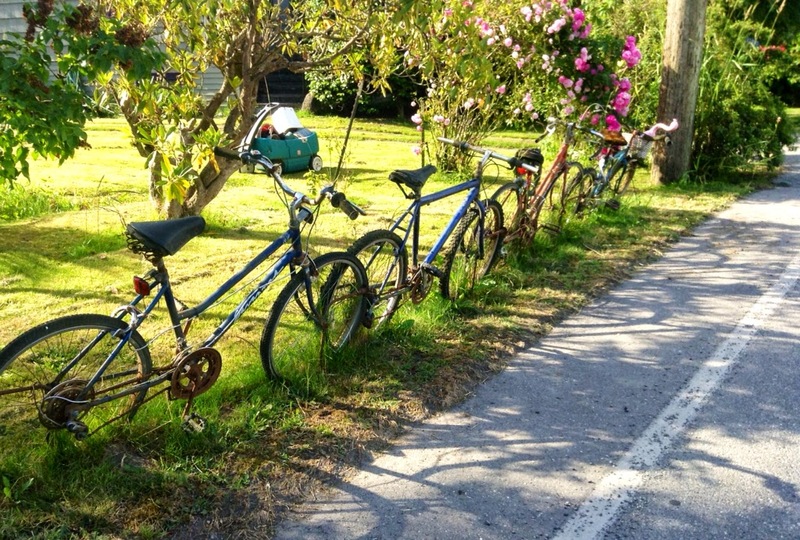 We had pedaled "like horses headed to the barn" (as Randy had said) for the last few days to make it to Sumas, and ending the trip here didn't quite justify all of that pedaling for me. I told Alex that now that we had arrived in Sumas, I wanted to keep riding to Bellingham. After all, it was a gorgeous day, the day's scenery had been nothing but beautiful, and I still had a lot of riding energy in me. Having arrived in Sumas, Alex decided he wasn't interested in biking any further. He said that I should go ahead and bike if I wanted to; he would find a way to get home. 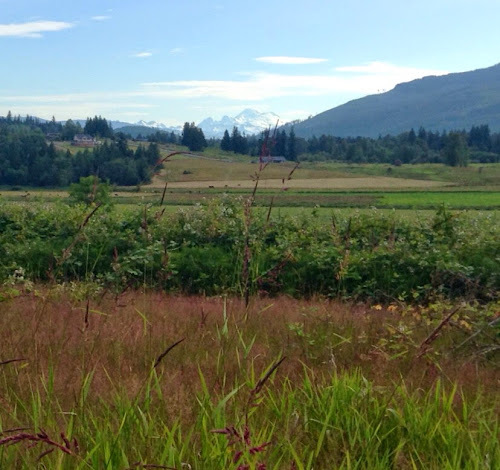 And so, I said goodbye to Alex, turned my bike around, and headed south back along Highway 9. After biking a few miles away from Sumas, mostly all of which was into a headwind, I pulled over on the side of the road to send two texts. First, I texted Alex to confirm that he had been able to arrange a ride home. He replied a bit later, stating that he was successful in arranging a ride. This was good news, as I wanted to make sure he wasn't going to be stranded in Sumas. I also sent a text to Ferit, who was going to be picking me up and driving me back to Seattle. I let him know that I'd be able to meet him in Bellingham instead of Sumas. I continued along my way. I didn't have a map with me, nor did I have access to any maps on my iPad without a wifi connection. In the spirit of adventure, I figured I'd just follow any signs that pointed towards Bellingham. I'm not sure whether I ended up taking the shortest route, or the most optimal route for cycling. It didn't really matter to me. What mattered was that I was still biking, with a smile on my face. As it turns out, my ride to Bellingham included the biggest climbs since south of Portland, though the climbs were quite trivial compared to our climbs in California and southern Oregon. Despite the climbing, the 25 miles to Bellingham passed quickly. I was excited to ride through Bellingham, as I had only been to Bellingham once before, and it was by automobile. I pulled up outside of a coffee shop just long enough to access a map using the shop's wifi. I identified a place to meet with Ferit at the south end of Bellingham, right off of I-5. He was already on his way, and would meet me in about 45 minutes. I biked the final distance to our meeting place, enjoying the views of some lovely historic neighborhoods along the way. I very much enjoyed my ride to Bellingham. It was the first time in more than 2,300 miles that I had the opportunity to ride by myself. I greatly enjoyed the solitude that comes with solo riding -- the ability to ride at whatever pace suits the moment, the ability to look around and smell the proverbial roses without being concerned about bumping into the tire ahead of me, and the ability to let my mind wander without distraction. Mostly importantly, the ride to Bellingham enabled me the opportunity to have some much-needed mental space to reflect on the trip. I look forward to sharing some of those reflections in a forthcoming post. By the end of today's ride, my odometer had clocked just over 96 miles, setting a new record for me -- the most miles biked in a single day on a tour. But it didn't feel as though I had logged 96 miles. My legs and my energy felt strong. I felt as though I could keep on riding. Forever. For me, the feeling of wanting to keep riding forever was the perfect way to end our trip along the Sierra-Cascade mountains, from the Mexican border to the Canadian border. Sarah. I didn't ride one inch along your ride, and yet I am feeling so many different things after reading this. First and foremost Damn proud of you lady. There was no doubt you'd make it but its still a ride to remember. Bummed beyond belief. I've been following this trip since the beginning (even before) I knew it would end, but I always kinda hoped it wouldn't. Impressed as hell that not only did you make the ride, you posted the entire time. Not just "Today we rode…" But in a way that made anyone reading able to feel the hills, wind, heat, cold snow and rain, yet smile and laugh every day. Finally grateful that you let us tag along. Lady you are one of a kind, and I can't wait to see what you come up with next. OH, and I think you set a record, by wearing both the most clothing possible (snow day at Crater Lake) and the Least (Solstice) You made this adventure your own, and Alex was lucky to have you along. Try to keep me from following along where those adventures take you :) I am glad the comments helped, I am very happy to have done my part to keep you moving north. And I agree, I've gotten to know you well these last few months, and I count myself as lucky to be able to call you a friend! Just don't tell my boss how often the class I was teaching at work had to do self study so I could catch up on your most recent day on the trail. AND I am glad they are happy tears! Sarah, you are an iron lady, however not like Margaret Thatcher... Proud of you and Alex finishing the trail. Sarah! I got so caught up in doing other stuff that I forgot about your blog. This morning, when I woke up, I thought about you and your adventure, and wondered how it went. So I just read the whole thing. Well done, woman! You almost make me want to get on a bike. Probably not, though. I will say that you inspired me months back to walk more, and I've kept up with that. I really enjoy finding new routes to the SAS, or downtown, and watching people's gardens change with the seasons. I also miss our Tuesdays at the shelter, spreading our love to all the cute little homeless furr balls. Looking forward to volunteering with you again when I return to Seattle.